Sometimes you want something fun and fancy for dessert but you don't have the time or the energy to put a lot of effort into it. 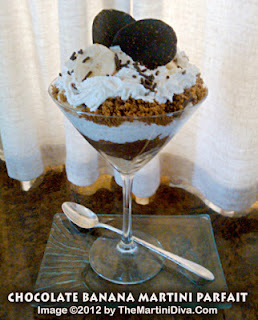 For me that means some kind of a pudding parfait in a martini glass. I always have fruit in the house, there's always some can or container of creamy topping, I keep several boxes of instant pudding on hand, as well as those little cups of ready to serve pudding and always have some form of cookie in the house. I also have a heavily stocked bar! As long you have these ingredients you can throw together a quick and yummy parfait with very little effort! The fancy comes from putting it in a martini glass (or any kind of stemmed glass) and in a clever garnish. Heck, you can even put it in shooters if you have small enough little spoons for your guests to dig out the parfait, these are perfect for cocktail parties and buffets! Start with a layer of banana slices, then layer on the pudding, then sprinkle on the crumbled cookies, drizzle the coffee liqueur on the cookies and add a layer of whipped cream. Repeat until the martini glass is full, usually twice. Garnish with a few banana slices and a fun chocolate candy! Can't get easier than that, right?